The gloves have two main functions. The first one is to increase the reflective power of your hands. In this way it will be much easier to play the harp in every condition. The second function is the protection that gloves gives to your skin. Indeed, while the KL-450 PLUS has relative powerful lasers, the KL-PRO has much powerful lasers that can prick your skin. Customized Laser Harps arrive to drive lasers of 10-15W power! And the our ILDA Controllers, can drive much powerful lasers that even can hurt your skin. 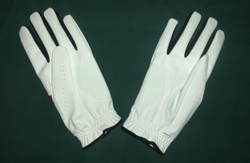 To prevent this, we strongly suggest to protect yourself by purchasing this gloves that have also a very elegant line.